Braised Potatoes with Bay and Mustard, Thyme for Cooking easy sides. This is an easy, side dish, with lots of flavor from the bay and mustard. 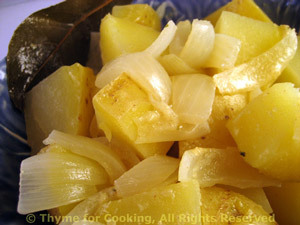 Put potatoes, onion, stock, mustard and bay leaves in small saucepan. Reduce heat and simmer until potatoes are just tender, about 30 minutes. Add a bit of water if they dry out. Remove bay leaves, drain and serve.